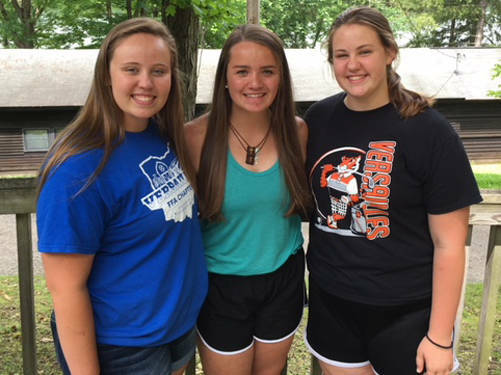 Versailles FFA members who attended the third session FFA Camp Muskingum included Courtney Batten, Tori Wuebker and Cayla Batten. CARROLLTON – Three Members of the Versailles FFA attended the third session of FFA Camp Muskingum in Carrollton. Members attending representing Versailles FFA included Tori Wuebker, Cayla Batten and Courtney Batten. While at camp, students participated in leadership, communications and cooperation focused workshops as well as many recreational and teamwork activities. Members also participated in various activities to increase their understanding and awareness of the environment. FFA members also had the opportunity to learn and share from the 2018-19 state FFA officers and National FFA officer from the Eastern Region.